This winter-that-wasn’t seems to be hanging around an awfully long time. After some warm April days that felt like summer, gardeners like me have been itching to get their hands dirty. Thankfully, I was wise enough not to go planting anything too tender to withstand a frost. Yesterday and today were positively snowy! I have, however, done a little bit of planting already. A week or two ago I planted some beets, lettuce and sugar snap peas (since we are moving at the end of June I am anxious to harvest a spring crop). I am waiting to sow much more until I am sure there won’t be anymore freezing wind and rain. Then my husband brought home a handful of cute little packets. 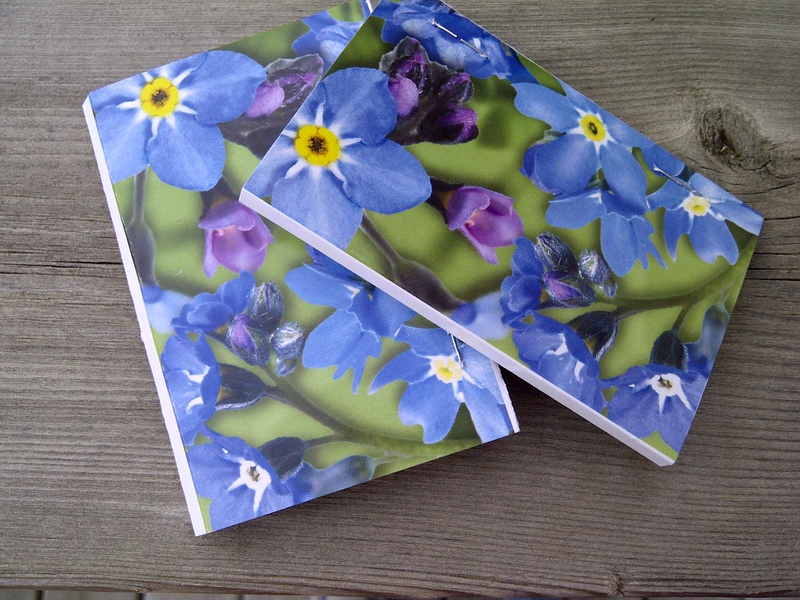 They are each about the size of a matchbook, and covered in pictures of Forget-Me-Nots. I asked him where he got them. “Work,” he said. And it was true. These pretty packages were from the funeral home. 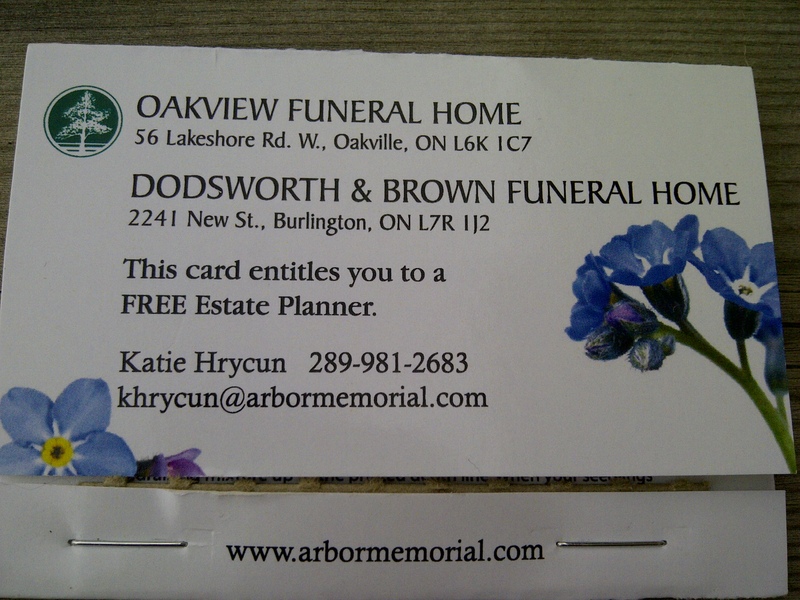 A clever business card of sorts, they advertise the services of a funeral director who specializes in estate planning. 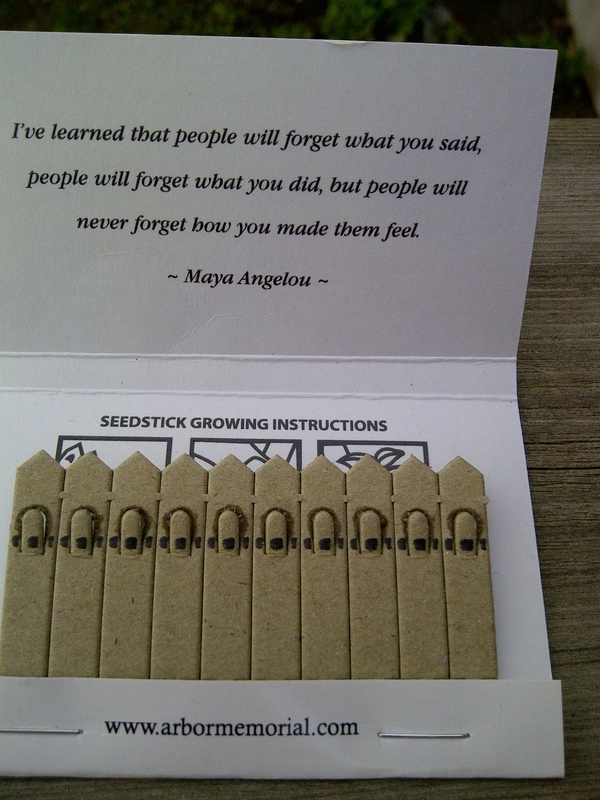 When I opened one up I discovered not matches, but tiny cardboard spikes, each with a few seeds at the end. Instructions indicated that these spikes were to be broken off one by one and stuck into the earth, where they would soon grow into a Forget-Me-Not plant. From the look of the illustrations, they are to be planted in small pots, but I am not always keen on following directions, so I headed outside into the spring garden. Knowing that plantings often look better with a whole cluster of plants rather than only one or two, I broke off the little spikes in all three packets and began sticking them in the ground. I chose a spot near some blue Forget-Me-Nots that had seeded themselves from last year, which I thought would make that corner of the garden look pretty. Unfortunately, it was only once I stepped back to take a photograph that I noticed what I had created. 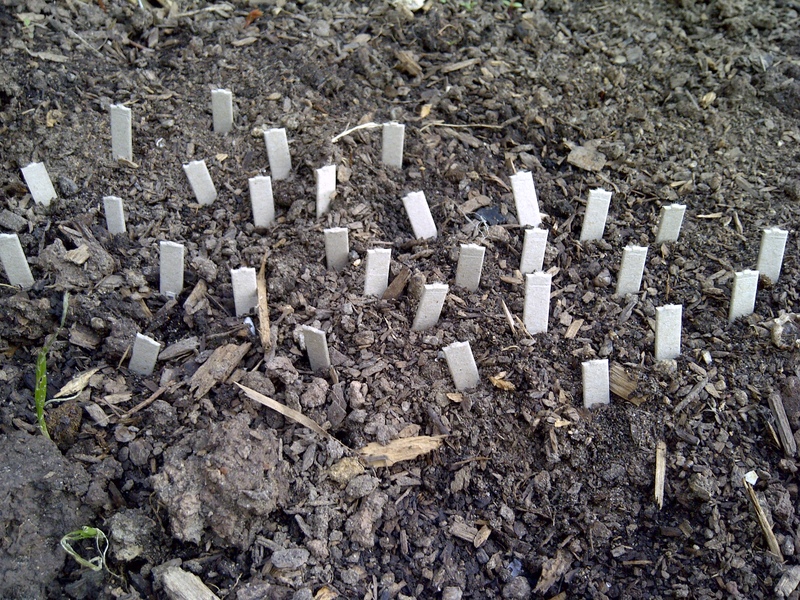 It may well look good in a few weeks’ time, but right now it looks like a tiny earthworm cemetery! Those little spikes, pushed partway into the ground, look like itty-bitty headstones. Oh my. Thankfully, although they are near our kitchen window, my worm graveyard is far too small for anyone to notice. Perhaps, like new projects or relationships that are awkward at first, they will turn out to be wonderful. Here’s hoping winter will soon pass and we’ll find out. This entry was posted in Uncategorized and tagged flowers, funeral, plants, seasons, seeds. Bookmark the permalink.